Let's start the recipe with preparing the chicken. Take the chicken(bone-in or boneless pieces), wash under tap water, pat dry with paper towel. Now take a pressure cooker, add chicken and all the ingredients under the heading 'For boiling the chicken', 3 cups of water and boil up to 2 whistles. Let the pressure release itself. Now take the chicken pieces out of the cooker, separate the flesh from the bone with a fork and shred the chicken flesh and keep aside for later use. Strain the chicken stock and keep aside, we'll use this water only, to make the gravy. Now make the 1st masala paste by grinding all the ingredients under the heading of '1st masala paste' in a small grinder and keep aside in a bowl. And make the 2nd masala paste by grinding all the ingredients under the heading of '2nd masala paste'. Don't clean the grinder after making the 1st masala paste. In the same grinder make the 2nd masala paste and keep aside this too. Take a non-stick pan, heat oil & ghee, add the sliced onion, little salt and fry till the onion becomes golden in colour. We'll not temper the oil with any whole spices, as we're going to use the chicken stock already flavoured with whole spices. Now add the 1st masala paste in the pan and fry till the raw smell of the masala goes off completely, but on medium low heat and by sprinkling some water to prevent it from burning. Now add tomato, roasted cumin coriander chili powder, garam masala powder and mix well. Now cover the pan and keep it on low heat to make the tomato soft. It'll take 30 seconds to 1 minute. Now open the lid and higher the heat to medium and keep stirring the mixture. Add the 2nd masala paste or the cashew poppy seeds & curd paste and again keep mixing till oil oozes from the mixture. Now add shredded chicken pieces, sugar, salt to taste and mix everything and keep stirring for 1 minute. Add the chicken stock which we reserved earlier, and cover the pan, boil the gravy on medium low heat for 5 minutes. After 5 minutes, uncover the pan & sprinkle kasoori methi, fresh cream, sliced egg and mix with the gravy gently. Now the texture of the gravy will be smooth & silky. Just check the salt, add some if needed, sprinkle chopped cilantro, little fresh cream and few slices of boiled egg and serve hot with any Indian bread. 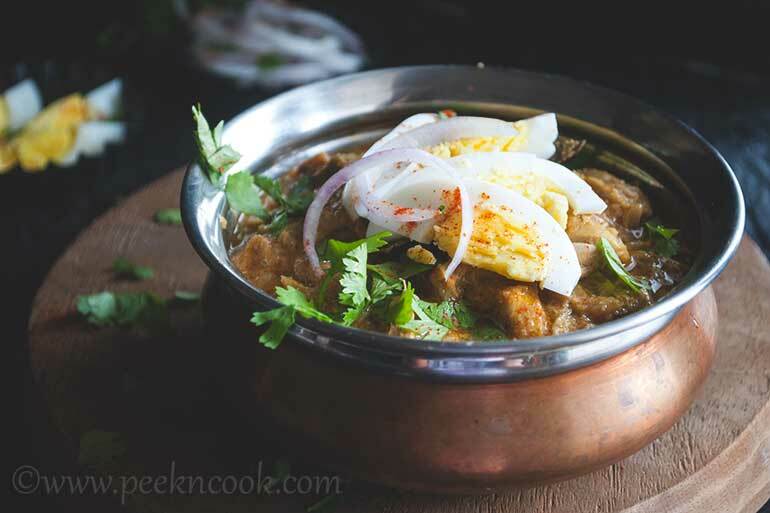 Enjoy the 'Kolkata style chicken bharta', and get back to us with your valuable feedback.